Whether your ornamental pool is a plastic tub or a backyard wonder with waterfalls and hidden lights, good water quality must be maintained. If not, the pool declines in beauty and the fish become stressed and susceptible to diseases. Once the basics of water quality are understood and practiced, maintenance will become second nature and require only a few hours per week. The first consideration is the availability of a good quality water supply adequate to fill the pool. The most common sources are city water and well water. Surface water from a creek or pond is not recommended as it may contain contaminants, diseases, or wild fish, any of which may harm the pool’s ecosystem. If city water is used, it must be dechlorinated. One week of sunlight (or less, if continuously aerated) will dechlorinate city water if the chlorine source is liquid or gaseous chlorine. If the chlorine source is chloramine, it is best removed by chemical dechlorination. Commercial dechlorinators made from sodium thiosulfate are available in liquid or pelleted forms from most aquarium and pool suppliers. Water volume of the pool must be determined before selecting a filter or pump or performing a chemical treatment. Knowing the pool’s water weight is very important before placing a free-standing pool on a patio, roof, or on the living room floor. Be careful, check your structural support, because water is very heavy. 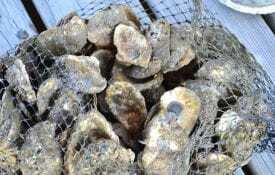 For information on calculating area and volume request Southern Regional Aquaculture Center (SRAC) Publication No. 103, “Calculating Area and Volume of Ponds and Tanks,” by M. P. Masser and J. W. Jensen, from your county Extension agent. Water quality is always a concern in any type of aquatic management. Water quality factors of common concern are dissolved oxygen, ammonia, nitrite, pH, alkalinity, hardness, carbon dioxide, and contaminants or pollutants (like pesticides). Not all of these factors deserve equal consideration. The following is a brief discussion of their importance as applied to ornamental pools. The amount of oxygen that will dissolve in water (D.O.) is very small and is measured in parts per million (ppm). The amount of oxygen in a pool can range from 0 ppm to more than 20 ppm. Oxygen dissolves directly into the pool from the air if the water is agitated (by wind, waterfalls, etc.) or from underwater plants, which excrete oxygen as a byproduct of photosynthesis. Decorative underwater plants produce oxygen. The amount of oxygen in the pool will vary, depending on the amount of agitation, numbers of fish and plants, time of day, and water temperature. More oxygen can dissolve in cool water than in warm. As temperature increases in the summer, fish increase their metabolism and less oxygen will be dissolved in the pool, particularly at night when underwater plants are also using oxygen in respiration. Fish will become severely stressed at less than 3 ppm D.O. and will die if oxygen concentrations fall near 1 ppm. Pool nutrients come from fish feed, wastes, decomposing leaves (etc. ), and from fertilizers applied to pool plants. 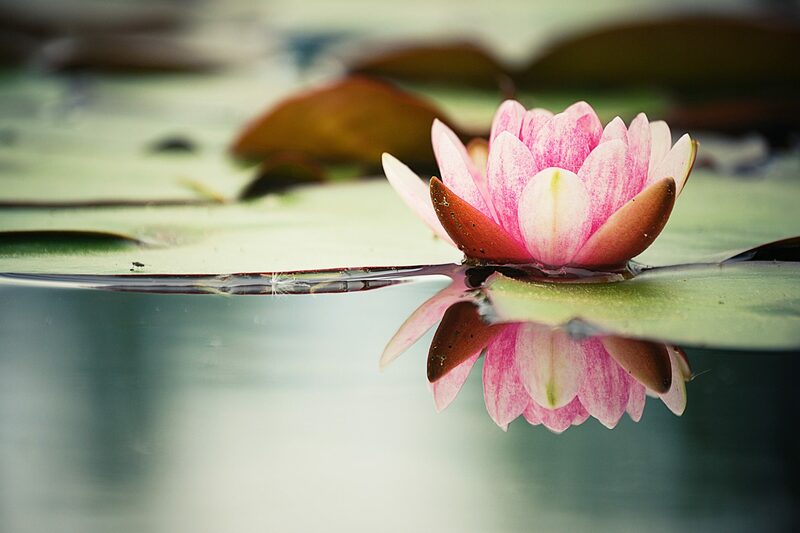 In a well-balanced pool, ornamental plants will remove nutrients rapidly and suppress algal growth. 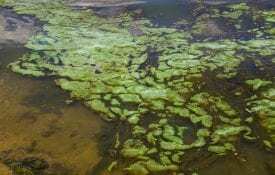 Excessive nutrients stimulate rapid algal growth or blooms. The clinging, filamentous kind of algae are not the problem that the free-floating blooms are. Algal blooms quickly become a nuisance, causing the water to become a cloudy green and restricting the view of fish. Dense algal blooms may cause oxygen depletions at night or during extended cloudy weather. Mechanical aeration, such as water falls or fountains, can maintain minimum dissolved oxygen concentrations and remove excess carbon dioxide. Still, excessive algal blooms should be controlled. The best method to control algal blooms is to avoid over-stocking and over-feeding of fish or over-fertilizing pool plants. Another common management strategy is to either increase decorative plants or use bio-filters to remove excess nutrients on which algae flourish. A third method is to replace or flush water through the pool to dilute nutrients and disperse algae. Ammonia is the major nitrogen waste excreted by fish. Certain types of bacteria decompose or nitrify ammonia to nitrite. Ammonia and nitrite are both toxic to fish but are seldom problems in ornamental pools. These compounds are normally removed from the water by pool plants and used as nutrients for growth. Ammonia and nitrite can become problems if the pool is over-fed, over-fertilized, or from rapid decomposition of organic matter (leaves, dead plants, fish, etc.). Remove excess ammonia and nitrite by biofiltration (see Filtration section), by flushing, or by additions of bacterial water conditioners. The pH is measured on a scale from 0 to 14 with 7 being neutral (less than 7 acidic, more than 7 basic). Pool pH cycles daily because of photosynthesis and respiration of plants and other organisms. Under normal conditions, pool pH can fluctuate from 6.5 to 9 without harming fish. A pH much above or below this range will stress or even kill fish. If the pH is fluctuating above or below 6.5 to 9, the pool needs buffers added to increase the alkalinity. Alkalinity is a measure of bases in water and is therefore related to pH. Alkalinity is measured in ppm (or mg/l) and can range from 0 to more than 300 ppm. Sufficient alkalinity buffers or resists pH changes. Alkalinity can be increased in the pool by adding carbonates (agricultural limestone, oyster shell, or bicarbonate of soda). In general, an alkalinity of greater than 20 ppm is considered adequate, but 50 ppm or greater is better. If you suspect any chemical contamination of the water, you can perform a simple bioassay using a few fish. Place 3 or 4 small fish in a minnow bucket and float it in the pool for 24 hours in an area that gets some circulation but no direct sunlight. If no deaths occur, the water is probably not contaminated. Use fish that look healthy to minimize the risk of introducing diseases into the pool. Do not set these fish free into the pool unless they are specific individuals you want stocked into the pool. Once you release fish into the pool it will be very difficult to remove them without draining the pool. Figure 1. 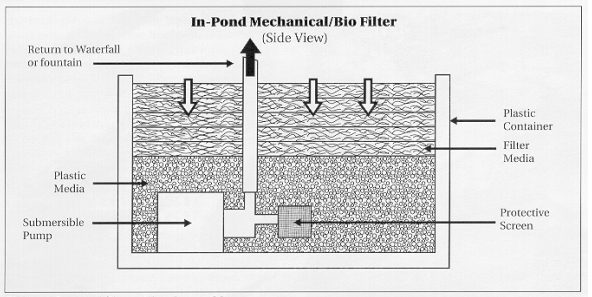 In-pond filter with submersible pump. Not all pools need filtration. Pools with abundant plants and a modest number of fish should not need filtration. The key is to maintain water quality and relatively clear water so your fish can be seen and enjoyed. 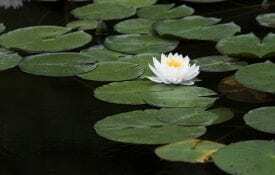 Again, ornamental plants are active biological filters, and, if a balance is maintained between the number of plants, the number of fish, and the amount of nutrients the pool receives, no other filtration may be necessary. Keeping the proper balance is as much an art as a science. 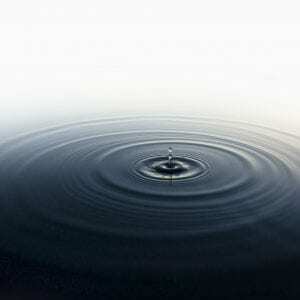 For this reason, many pool owners become frustrated with trying to maintain balance and opt for additional filtration. The two basic types of filters are mechanical and biological. Mechanical filters remove or trap particles of dirt and organic matter. Typical mechanical filters include leaf skimmers, sand beds, foam or cartridge filters, and settling basins. Leaf skimmers, foam filters, or some type of settling basin are the most commonly used mechanical filters. Sand filters and cartridge filters, like those used in swimming pools or hot tubs, are not generally used in ornamental pools because they clog or channel quickly and require fairly large volumes of water for back-washing. Biological filtration removes excess nitrogen produced from fish wastes and decomposition of organic matter. Natural biological filtration comes from nutrient removal by plants, algae, and bacteria. Decorative plants remove nutrients and slow water currents that cause suspended particles to fall out of the water column. Bacteria also remove nutrients, but only if provided with the proper substrate and environment. Bacterial bio-filters are becoming common in ornamental pools, particularly those in which fish are the major attraction. Bio-filters require little maintenance if properly designed and installed. Bacterial bio-filters rely on bacterial growth to clean the water of wastes. Bio-filters contain layers of gravel or coarse sand, corrugated plastic sheets, plastic rings, mesh, or foam, or some other material as a substrate or media on which bacteria grow. Like plants, the bacteria remove wastes as nutrients for growth. Bio-filters operate best at a pH of 7 to 7.5 and an alkalinity of around 50 ppm. Adjustments in pH and alkalinity can be done using agricultural limestone, oyster shell, and bicarbonate of soda. Under-gravel filters, common in aquariums, are one of the simplest types of bio-filters. In these filters, the gravel acts as a mechanical filter and is colonized by bacteria. Large gravel filters can be built into the pool bottom or into the bed of a stream or brook that flows into the pool. The problem with gravel filters is that they become clogged with solids and require laborious cleaning. 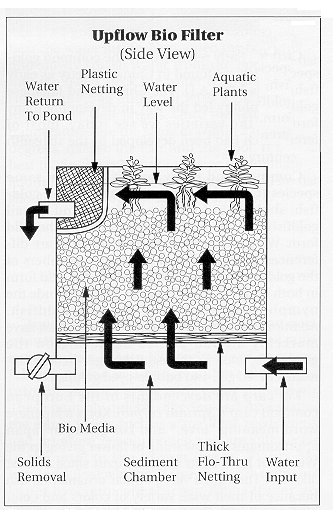 A common type of in-pond filter uses plastic media and foam surrounding or connected to a submersible pump to accomplish both mechanical and biological filtration (Figure 1). The pump draws water through the filter media, trapping sediment and providing an area for bacteria to grow. This type of filter requires that you remove sediment periodically and clean the foam every 1 or 2 days. Sediment should not be allowed to build up in the bottom of the filter. An up-flow bio-filter is another popular design (Figure 2). As the name indicates, water enters the filter from the bottom and exits through the top. Stainless steel or plastic mesh is used to hold the bio-filter media off the bottom and it thus creates a sediment basin. Plastic beads and other coarse media are colonized by bacteria. Plants can be added to the surface of the filter for added nutrient removal. Up-flow filters are usually self-contained and separate from the pool. Other designs for bio-filters can be found in aquaculture and ornamental pool publications.